Me, Bobby Martinez and Luke Fenwick were all sitting around a table at Bubba’s Bar this last weekend. We was talking about how come Goofy is able to drive, have a job and talk while Pluto can’t do any of those things. Goofy acts like a people type while Pluto acts like a dog. But they both look like dogs. It just don’t make no sense. Anyhow, we started talking about other stuff because it takes a bunch like us two pitchers of beer to figure out that we will just never know the answers to some questions in this lifetime. Scariest Movies (as picked by three drunk fellers). Jack Nicholson is married to Shelly DuVall. And if that ain’t scary enough, he goes crazy in this haunted hotel and tries to hack up Shelly and his creepy kid with a fire axe. I saw this when I was a kid. For a few months after, I wouldn’t even run through a sprinkler much less go swimmin’ in the lake. If I ever do ‘The Best Crusty Old Sea Dogs Ever in a Movie’ list, Robert Shaw as Quint goes to the top of the list. They have it coming to ‘em, and coming big time. Knife. Bathtub. And every dude will cross his legs. Trust me. What you say? No way Elwood! Remember, these are the top 10 scariest movies picked by drunk fellers. When you’re hammered, those danged Oompa Loompas is scary, dude. Plus, when you watch it as a grown-up now, Willie seems a little…funny. Funny in a “Chris Hansen telling you to go have a seat over there” kind of way. THE classic! 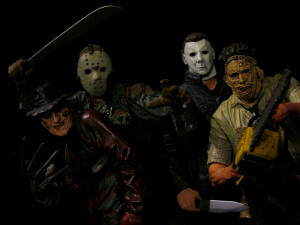 Leather Face and his messed up, in-bred cannibal family. Tobe Hooper made this for about $300,000. The dinner table scene is creepy as all get out. Grandpa…sheesh. John Carpenter launched the career of one Jamie Lee Curtis. She was a screamer. Michael Myers is one of the scariest things to ever put on a William Shatner face since William Shatner. Barbara Streisand. ‘Nuff said about that. The first one, and not that crappy remake they did a couple of years ago. Freddy Krueger is just plain scary here. In the movies after this, they tried to make him funny. In this one, he is one scary joker who makes a lot of teen sushi with that knife claw glove of his. Johnny Depp gets run through a bed that turns into a food processor. That scene in the alley when his arms grow. That’ll give you a case of the shivers. Jason gets a hankering to make cutlets and filets out of a bunch of stupid kids. They basically just made the same movie over and over again. Which is AWESOME! Friday The 13th – Momma did it. Creepy Jason boy jumps out of the water at the end. Friday the 13th II – Jason starts slicing and dicing. Wears a pillowcase to cover the mush that makes up his face. Friday the 13th III – Came out in 3D. Jason gets a hockey mask and chopper flicks get an icon. Friday the 13th IV – Jason gets killed at the end by Cory Feldman Yes, Cory Feldman. Friday the 13th V – Imposter Jason. Friday the 13th VI – Jason comes back a psycho zombie. Friday the 13th VII – Zombie Jason gets sucked off the bottom of the lake by a psychic chick. Jason goes shopping for teen yuppie meat. Friday the 13th VIII – Zombie Jason gets on a cruise boat going to New York City and slices his way through Manhattan. Friday the 13th IX – Zombie Jason gets blowed by the military up but you can’t keep a good zombie down. Friday the 13th X – Zombie Jason gets thawed out in the future on a space ship and gets an upgrade. He ain’t happy. John Carpenter did this remake that was a lot scarier than the one from back in the 1950’s. The one in the 1950’s had Marshall Dillon as the alien. The one from the 1980’s had a German shepherd head sprouting spider legs. Kurt Russell at his tail-kicking best. Devil possessed kids is scary. Pea soup in the priest’s face. A little girl crawling down the stairs like a crazy demon spider crab child. And Linda Blair’s ugly made up face with those green funky eyes. Yeah, I won’t watch this one anymore. So, if any of you single, available gals want to cuddle up with ol’ Elwood and watch a few of these you can send me an e-mail at epjenkins@gmail.com. This entry was posted in Almost True. Sorta. on October 29, 2015 by epjenkins.